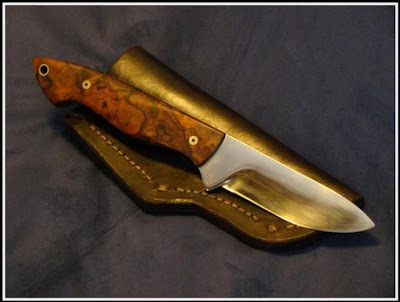 I was asked by a member of forum a read pretty regularly to have a go at developing and making a drop point hunter. Here's how it turned out. It's made of 1/8 inch O1 tool steel. The blade is about 3 1/2 inches long and its about 8 1/2 inches overall. 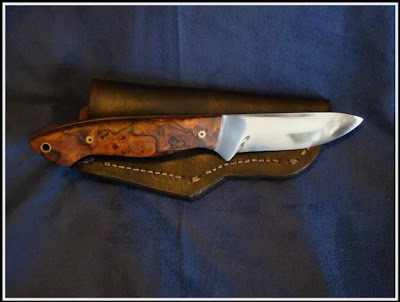 The handle is ironwood burl from arizonaironwood.com. It's fitted with black spacers, 3/16 mosaic ping, and a 1/4 inch thong tube. 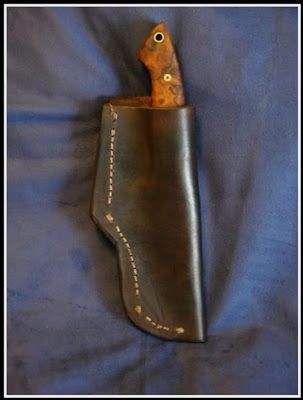 The sheath came out pretty well. I'm still getting the hang of the leather thing. This one was, at least, not compare by the wife to a sculpture of cat crap with a knife in it... ;-). This is my idea for the heavyweight squirrel rifle. It has an 18" Clark Barrel, rimfire technologies, trigger, guidrod, a bolt reworked by Randy @ CPC, a custom modified and hand finished stock from Boyd's, but best of all.... it has this. This is a flanged bedding pillar made from the brass stock of a pressure hose fitting. 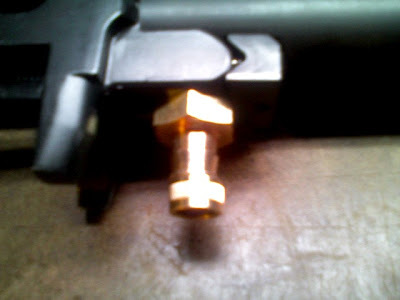 By bedding the action on a solid tube of metal which is, in turn, epoxied into the stock allows the action and the barrel to be floated free. The result is, in theory anyway, a more accurate action and barrel combination. I also pillar bedded the trigger grouping to complete the setup. 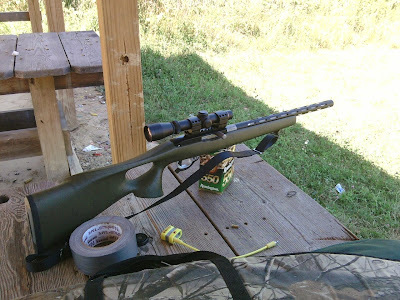 I have three rifles I will be working up for the season this year. Two are 10/22's, one of which is not ready. I need to assemble it tonight. The other is my one-season-old standby, the OD green / GM aero barrelled / Luepold scoped shooter. The third is something different for me. I decided it's time to branch out a bit and purchased a Marlin 980S. I dropped a scope on it and I think it will be a dandy. I have a couple of sets of qd rings and I am going to test the idea of having two scopes sighted for two radically different loads. The first will be for CCI stingers. I love Bentz chambers but I will be glad to pack as much as possible into the stock chamber for a change. The other will be for use with Aguila SSS Sniper Subsonic rounds. I am anxious to try them. We'll see how it goes.